Chatty, a talking mannequin with a human face, is on display at the Tokyo International Anime Fair 2006 (at Tokyo Big Sight through March 26). Developed by Ishikawa Optics & Art Corporation, Chatty has a face that is brought to life by means of a video projector inside its head. 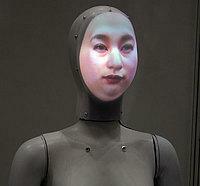 A video image of an actual human face (or the face of a computer-generated character, if you prefer) is projected onto the inner surface of the mannequin's face, which serves as a three-dimensional video screen. Audio synced with Chatty's video lip movements gives the face an astonishingly realistic look. Chatty's presence at the anime fair brings Ishikawa one step closer toward realizing its dream, which is to see the technology behind Chatty's face be put to use in speech-capable historical figures for museum exhibits, theme park guides, or human-faced androids. UPDATE: Video of Chatty emerges. The Humpty Dumpty mantra continues. That's a really cool idea. By the photo, I wouldn't have guessed that the face is just a projection from inside, it looks scuplted or something. Even the video on Chatty's looks is quite realistic. Chatty's purpose can be quite useful I'm sure, but I just hope that its presence at the Anime fair didn't give some fairgoers any crazy ideas. I wonder if there could be a way to utilize this technology to one day help people who have facial abnormailities or burn victims and such. How nice it would be to be able to offer someone a "new face". Then again, how dangerous that could be, too.